Westons Cider, situated deep in the heart of the Herefordshire countryside in the old village of Much Marcle, has a long history of cidermaking in the United Kingdom. In 1878 Henry Weston came to farm at The Bounds, a farmhouse nestled among apple and perry pear orchards. Over time the cider works has evolved, and now it is a major cider producer in the UK and around the world, with brands like Stowford Press, Mortimers Orchard, Caple Rd, and crafted lines Wyld Wood, Henry Westons and Old Rosie. Westons currently exports to more than 40 countries worldwide and produces over 30 different ciders and perries. 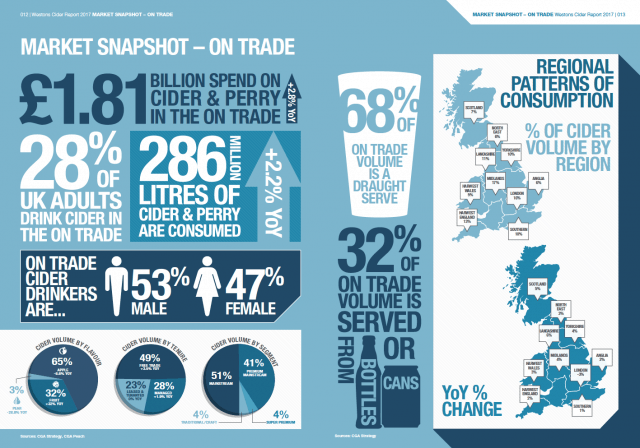 Every year Westons publishes the Cider Report, an opportunity to share its passion, insight and understanding of the UK cider marketplace and provide some signposts to give you a view of the future of cidermaking and where possible opportunities lie. If you are passionate about cider and looking for information on the UK cider market, this report is an enlightening and enjoyable read. Get more information about Westons online, and download the Cider Report by following this link.